Our community was founded on the rich history of gold mining and early western settlement. The Amador Community Foundation is home for several funds that support Amador’s historic preservation. Donors may direct their contributions to a specific fund, or merely to “historic preservation”, and the Amador Community Foundation will assure that they are wisely spent. The Sutter Creek Community Benefit Foundation is in the process of transforming one of Sutter Creek’s vacant lots at the South end of Main Street into an amazing historical display of Gold Mining history. Artifacts from the Argonaut Mine and the Sutter Gold Mine have been donated to show visitors and residents the rich Sutter Creek Gold Mining history. Along with the mining artifacts, the new passive park will have informative plaques for the artifacts, picnic benches, trees, and “Chinese” rock walls lining the park, which are historic for the area. A “name the park” contest was held and on June 1st, 2015 and the new Miners’ Park was dedicated by Sutter Creek Mayor Jim Swift. 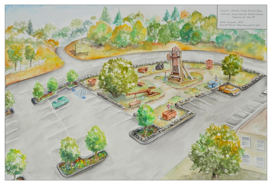 This amazing new addition to Sutter Creek will be made possible through the generosity of donations from people who wish to see Sutter Creek’s history maintained.For more information please contact Frank Cunha at frank@sccbf.org or go to sccbf.org. Restoration of the historic Willow Springs Elementary School on Jackson Road (Hwy. 16) will begin in the spring of 2013. The Amador Community Foundation helped kick off the project with a grant to paint and repair the roof. The Sutter Creek Fire District (SCFD) and the Sutter Creek Volunteer Fire Department (SCVFD) initiated a Fire History Program in 2005/2006 to commemorate the 100th Anniversary of the Sutter Creek Fire District (The SCVFD is much older, dating from at least 1869). SCFD/SCVFD and the City of Amador City have recently completed the rehab and development of the old Amador City fire station into a small museum to house the1939 Dodge fire truck that was built in Sutter Creek. Along with the fire truck, are some other early fire fighting equipment and wall displays related to the fire history of Amador City. The total material costs for this project were about $2500 and were supplied by the Amador Community Foundation, the City of Amador City, SCFD/SCVFD and local donations. This project is just one of several that the SCFD/SCVFD has undertaken in the past ten years since the inception of their history program in 2005. During this time, SCFD/SCVFD has rebuilt and displayed several pieces of vintage fire fighting equipment; rehabbed and re-equipped the Amador City fire truck, produced a broadsheet style history overview of the SCFD/SCVFD, and relocated the first Sutter Creek fire bell to the Main Fire Station and placed a historic marker related to the bell. 1 – Repair the existing fire bell tower on Main Street at City Hall and reconstruct the fire hose cart house that was originally located under this bell tower. Display a hose cart in this hose cart house with interpretive signage that tells the history of the bell and the first Hose Cart Company #3. 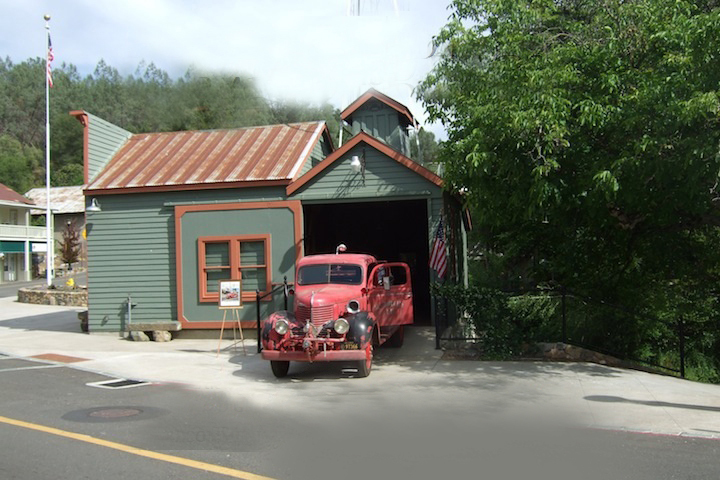 2 – Recreate the first Sutter Creek fire truck that was built by local mechanics in the 1920’s. Using an early 1920’s era Dodge Brothers light truck, local mechanics mounted a chemical fire extinguisher that had been purchased in 1912, along with a hose reel, ladder and other fire fighting equipment. 3 – Rehab and develop the old Sutter Creek Firehouse on Main Street that was built in the early 1930’s as a museum and display space for the early fire fighting equipment and it would also house and display the bulk of the photographs, maps and posters that the SCFD have assembled since 2005. Logging and mining played a key role in the economy of Amador County beginning in the 1800s. California’s only operational steam powered splinter sawmill from that era is owned and operated by the Amador Sawmill and Mining Association, a nonprofit organization dedicated to preserving this bit of our heritage. The sawmill, operated by volunteers since 1968, is an authentic, antique mill. Sawmills like this were once located throughout Amador County and the Mother Lode region from the 1850s through the 1940s. Historically, lumber from these small sawmills was typically used to shore up tunnels in mine shafts to prevent cave-ins and for sluice boxes and flumes. The Amador Community Foundation granted $500 to help toward the cost of installing a boiler to provide steam to the engine. 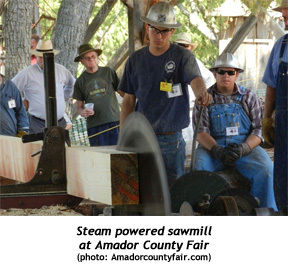 Now, the working sawmill can be seen on display during the Amador County Fair in July, and is available for custom cut jobs for non-profits, museums, and governmental museums that want rough cut timbers or lumber for historic restoration & preservation projects.